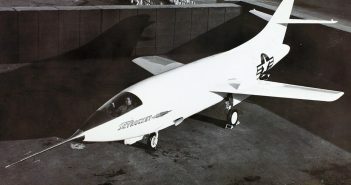 Harry Geier, director of marketing & development at the Planes of Fame Air Museum in Chino, California, discusses the Douglas D-558-2 Skyrocket test aircraft, which the US Navy used to learn about subsonic and supersonic flight, during a November 2017 interview with Defense & Aerospace Report Editor Vago Muradian taped at the museum. 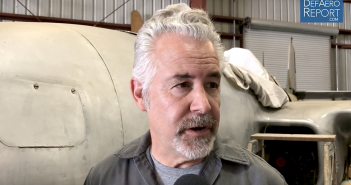 Harry Geier, director of marketing and development at the Planes of Fame Air Museum in Chino, California, discusses the RF-84K Thunderflash that was tested by (and reportedly intimidated) World War II triple ace Col. Bud Anderson, USAF Ret., during a November 2017 interview with Defense & Aerospace Report Editor Vago Muradian taped at the museum. 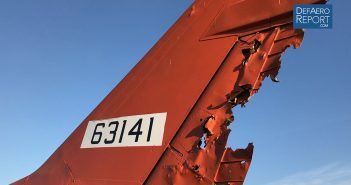 Harry Geier, director of marketing and development at the Planes of Fame Air Museum in Chino, California, gives Defense & Aerospace Report Editor Vago Muradian a close-up look at a missile-damaged F-100 Super Sabre that was being operated “as a drone-target-towing aircraft” near Edwards Air Force Base when it was hit by two rockets (one of which exploded and completely blew off its righthand horizontal stabilizer) during a November 2017 interview at the museum. 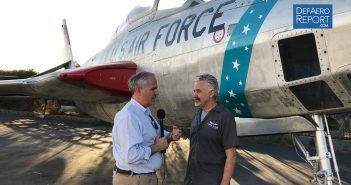 Harry Geier, marketing and development director at the Planes of Fame Air Museum in Chino, California, discusses the Bell P-59 Airacomet, the first US-produced fighter jet, and which the museum is trying to get back in flight, during a Nov. 29, 2017, interview with Defense & Aerospace Report Editor Vago Muradian conducted at the museum. Our coverage was sponsored by Leonardo DRS. 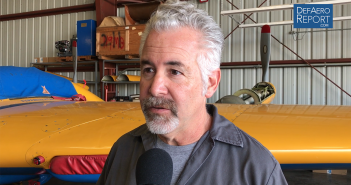 Harry Geier, marketing and development director at the Planes of Fame Air Museum in Chino, California, discusses the Northrop N9MB Flying Wing, a test model the company built while developing a full-sized bomber, during a Nov. 29, 2017, interview with Defense & Aerospace Report Editor Vago Muradian conducted at the museum. Our coverage was sponsored by Leonardo DRS. Gen. Tony McPeak, USAF Ret., 14th US Air Force chief of staff and a 2017 Air Force Association Lifetime Achievement Award recipient, reflects on lessons learned from reorganizing the US Air Force and why military jointness can be a challenge for the service during Part 4 of his Sept. 18, 2017, interview at AFA’s 2017 Air, Space & Cyber conference and trade show. The event was held in National Harbor, Md., just outside of Washington. 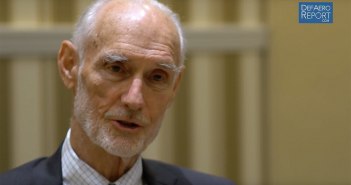 The Defense & Aerospace Report’s coverage is sponsored by L3 Technologies and Leonardo DRS, and this interview is in partnership with the Air Force Association. 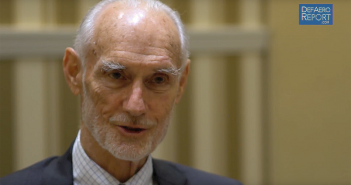 Gen. Tony McPeak, USAF Ret., 14th US Air Force chief of staff and a 2017 Air Force Association Lifetime Achievement Award recipient, discusses the morality of the US involvement in the Vietnam War, becoming US Air Force chief and the job’s challenges during Part 3 of his Sept. 18, 2017, interview at AFA’s 2017 Air, Space & Cyber conference and trade show. The event was held in National Harbor, Md., just outside of Washington. 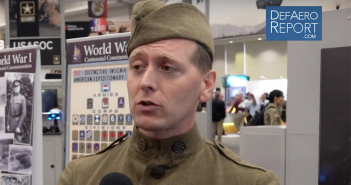 The Defense & Aerospace Report’s coverage is sponsored by L3 Technologies and Leonardo DRS, and this interview is in partnership with the Air Force Association. 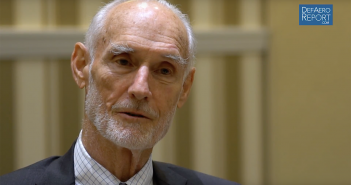 Gen. Tony McPeak, USAF Ret., 14th US Air Force chief of staff and a 2017 Air Force Association Lifetime Achievement Award recipient, discusses his experience as a MISTY Fast Forward Air Controller during the Vietnam War and leadership lessons learned in Part 2 of his Sept. 18, 2017, interview at AFA’s 2017 Air, Space & Cyber conference and trade show. The event was held in National Harbor, Md., just outside of Washington. 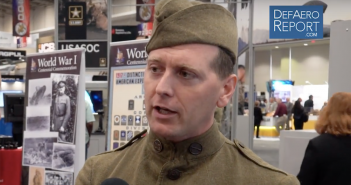 The Defense & Aerospace Report’s coverage is sponsored by L3 Technologies and Leonardo DRS, and this interview is in partnership with the Air Force Association.